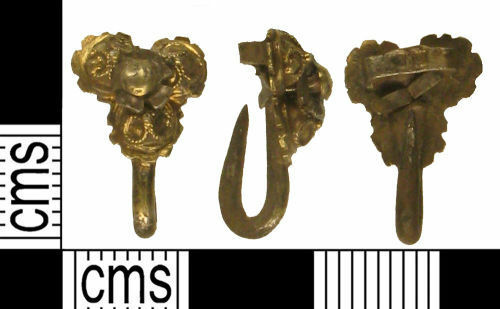 A Post Medieval silver-gilt dress hook with trefoil-shaped back plate with cusped edge. The back-plate supports three hemispherical bosses, each with applied filigree ornament in the form of three circlets with granulated knops, the inner circlet of each with no knop. In the centr there is an aperture holds a central rosette attached by a rivet (see Gaimster, D., et al, 'Tudor Silver-Gilt Dress-Hooks', The Antiquaries Journal, 2002, Vol. 82, pp. 157-196, fig. 5, p. 163). On the reverse is soldered an incurved hook. For similar example see 2005 T142, HAMP-C1FA51.